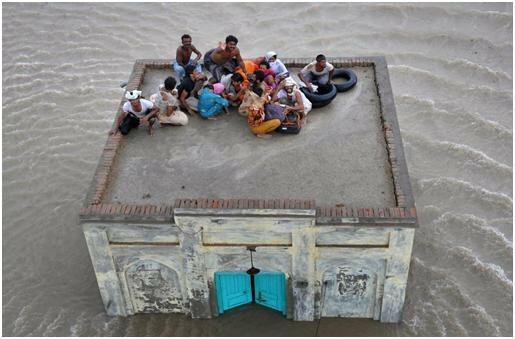 Crops and houses destroyed in latest floods that have killed 132 people and affected millions. The Pakistani province of Sindh has declared five flood-hit districts to be "calamity areas" - short of food, housing and medical supplies. Officials say that at least five million people have been affected by floods across the country, with thousands forced to vacate their homes. Thousands of rice, cotton and sugar cane crops have been destroyed. Heavy rainfall is continuing on Tuesday. The worst of the flooding has hit the interior of Sindh. The provincial government says that the districts of Nawabshah - the home of President Zardari - and the districts of Badin, Tandoallahyar, Sakrand and Ghotki have been especially badly hit. The BBC's Hafeez Chachar in Islamabad recently visited Sakrand and Ghotki and says that the situation in these areas is increasingly desperate, with displaced people searching for somewhere to camp on higher ground and shortages of food and medical supplies becoming ever more apparent. Our correspondent says that while the flooding so far has only seriously affected five out of 22 districts in Sindh, for those caught up in the flooding the situation is ominously comparable to the floods of 2010, which destroyed more than 1.5 million homes across Pakistan and cost an estimated $10bn in direct and indirect losses. "Floods triggered by heavy rains have killed 132 people and affected four to five million people," National Disaster Management Authority head Zafar Qadir said on Monday. He said that most of those killed died as a result of falling roofs, drowning and water-borne diseases. An unknown number of women and children are among the victims. "The magnitude of the calamity is worse than our expectations. We are facing difficulties with every passing time," Dr Qadir said. "A total of 690,000 houses were damaged, in which 250,000 were completely destroyed,"
Dr Qadir said that the floods had also killed an estimated 100,000 cattle.